Did you know that “getting old and enjoying it” was a trending topic in 2015? How to keep the momentum going. #1 Grannyhair: Celebrities like Pink, Kylie Jenner and Nicole Richie opted to go fifty shades of gray this year by dyeing their natural locks gray. This trend has trickled down to naturally gray haired women and encouraged the acceptance of gray hair as glamorous and beautiful. 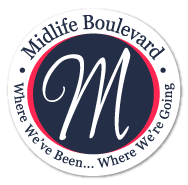 The Mid Life featured a guest post by another midlife blogger telling about her going gray experience. #2 Cover Girls Women: The magazine industry jumped on this trend and proved that you can be beautiful at any age by straying from the typical cover girl and featuring women over the age of 40, such as Julianne Moore and Viola Davis, in major publications. I got his AARP Magazine in the mail last year. #3 Movies: While you may have heard the saying “don’t believe everything you see in the movies,” this year the film industry truly reflected the trend of embracing aging. Some of this year’s best sellers highlighted that it’s never too late to start over, with films such as The Intern, Age of Adeline, and Second Best Exotic Marigold Hotel. #4 Pfizer’s Get Old: The pharmaceutical company Pfizer continued their multi-year initiative, Get Old. They launched the “Get Ready. Get Set. Get Old.” campaign this June with the release of the “Commencement Day” video spreading the message that there is no pre-determined age for embarking on a life event. Get Old also launched Life Forecast, a tool designed to encourage consumers to take an active role in their own health and well-being, by taking a fun approach to “forecast” people’s experiences by the time they reach 100 years old based on current ages and interests. I had fun figuring out my Life Forecast. #5 Skin protection: This year, more people begin to understand the risks of sun damage and take action to protect their skin in order to live a healthy life. The National Cancer Institute projects that by 2020, the number of adults 18 and older who follow protective measures against the sun will increase to 73.7%. [i] The Mid Life Guru is all about proper skin protection as we age. #6 Getting Fit: Similar to sun protection, exercise continues to be an activity seniors are embracing to live healthier lives. New statistics show that the elderly who exercise live 5 years longer[ii]. With this in mind, in 2015 seniors have taken an active role in their health by getting physical and staying in shape. Parks worldwide are being designed and redesigned with physical activity for seniors in mind, and Barcelona alone has around 300 seniors-only parks. [iii] Healthy Living through exercise is one of the Mid Life Guru’s five main topic areas. #8 seniors at Sea: As the aging population reaches retirement, it is the perfect time for vacation. Fortunately, there are now travel experiences being tailored to mature adults so they can comfortably travel the world[vi]. #10 The Comeback: Red lips[viii] and high waisted jeans[ix] made a huge comeback this year, bringing the classic vintage look to the modern girl’s closet. #12 Who to Follow over 50: Social media isn’t just for the young. In 2015, the older generation continued to dominate the social scene on Instagram, Pinterest and Facebook in particular, which has seen a significant rise of the senior population. Blogs have also become a platform for the older generation, as a place where seniors can go for questions and topics on aging. Be sure to visit sites like HuffPost 50 and The Midlife Guru for all of your aging needs and advice. From fashion and beauty to magazines, advertising and technology, 2015 proved to be the year of celebrating aging. Whether it’s trying a new city or starting a new job, life is not always clearly defined. As our population continues to age, it is a breath of fresh air to see trends that skew towards celebrating life’s second acts. Which getting old trend will you embrace in 2016? [i] UV Exposure and Sun Protective Practices. National Cancer Institute Web Site. http://progressreport.cancer.gov/prevention/sun_protection Published March 2015. Accessed December 9, 2015. [ii] Elderly people who exercise ‘live five years longer.’ BBC Web Site. http://www.bbc.com/news/health-32735723 Published May 15, 2015. Accessed December 1, 2015. [iii] Playgrounds For Seniors Improve Fitness, Reduce Isolation. Huffington Post Web Site. http://www.huffingtonpost.com/2015/06/04/playgrounds-for-seniors_n_7452270.html Published June 4, 2015. Accessed December 1, 2015. [iv] Why Older Women Are the New It-Girls of Fashion. AdWeek Web Site. http://www.adweek.com/news/advertising-branding/why-older-women-are-new-it-girls-fashion-163871 Published April 6, 2015. Accessed December 1, 2015. [vi] United States Vacations for Seniors. USA Today Web Site. http://traveltips.usatoday.com/united-states-vacations-seniors-34846.html Accessed December 1, 2015. [vii] Why This 50-Year-Old Mother Of Two Is Moving Across The World To China. HuffPost 50 Web Site. Published February 2, 2015. Accessed December 1, 2015. [viii] Beauty Buzz: Red lips are back, plus all the latest news from the world of beauty. Daily Mail Web Site. http://www.dailymail.co.uk/home/you/article-3041727/Beauty-Buzz-Red-lips-plus-latest-news-world-beauty.html Published April 18, 2015. Accessed December 1, 2015. [ix] The Best High-Waisted Jeans For YOU. Refinery 29 Web Site. http://www.refinery29.com/high-waisted-jeans-styles#slide Published July 24, 2015. Accessed December 1, 2015. [xi] Americans’ Internet Access: 2000-2015. Pew Research Web Site. http://www.pewinternet.org/2015/06/26/americans-internet-access-2000-2015/?utm_expid=53098246-2.Lly4CFSVQG2lphsg-KopIg.0&utm_referrer=https%3A%2F%2Fwww.google.com%2F Published June 26, 2015. Accessed December 1, 2015. [xii] AARP launches $40 million fund to develop technology for seniors. Fortune Web Site. http://fortune.com/2015/10/01/aarp-jpmorgan-fund-seniors/ Published October 1, 2015. Accessed December 1, 2015. What Will 100 Years Old Look Like For You?